It’s March 5, 1991. Someday by Mariah Carey is ruling the airwaves while television stations across the nation are seeing the infamous tape involving Rodney King and the LAPD. We could dive in deeper, but I think you get the picture. For NHL fans, its one of the most exhilarating days on the NHL schedule: The Trade Deadline. The St. Louis Blues find themselves deadlocked in a battle with the Chicago Blackhawks for the Norris Division lead. Led by Brett Hull, who already amassed 70 of his 86 total goals that season, the Blues were looking to add the final touch of seasoning to their gourmet steak. General manager Ron Caron swung a move that he thought would push the club to its first Stanley Cup since the franchise’s 1967 inception. The 1990-91 Blues possessed high-flying speed from defenseman Jeff Brown and even honed hard-nosed antics from Scott Stevens, but it wasn’t enough. Goaltenders Vincent Riendeau and Curtis Joseph were being peppered on a nightly basis, so Caron swung a deal to acquire another brute defenseman, while not sacrificing the offense that had to go the other way (or so he thought). He sent Geoff Courtnall, Robert Dirk, Sergio Momesso, Cliff Ronning and a 1992 fifth-round draft pick to the Vancouver Canucks in exchange for defenseman Garth Butcher and highly touted 26-year-old forward Dan Quinn. This was the team that Caron wanted in the playoffs. The result? A six-game loss to the Minnesota North Stars in the Norris Division finals. The deal that changed the makeup of the roster became known as one of the most lopsided deals in NHL history. Quinn played out the remainder of the season in a Blues jersey and Butcher went on to post a sub-par plus-3 rating in parts of four seasons for the Bluenote. As St. Louis Post-Dispatch writer Dan O’Neill mentioned in a recent column, the current Blues are drawing parallels to the 1990-91 team. Those Blues were winless in their final six games of the season; as was this season’s lineup. This time around, the team landed a starting netminder. Ryan Miller, the 2010 Olympic hero and Buffalo Sabres last-line-of-defense goaltender for what seemed like eons, looks to rewrite history after going winless in his final five games with his disastrous 3.82 GAA and .856 save percentage mirroring his play. The final crawl of the season doesn’t seem to faze the forever-optimistic American netminder. Pressure is something that comes hand in hand with the NHL playoffs, but even more so when you’re a team that has never won a Stanley Cup. Miller was brought in by the Blues to help them accomplish just that — win a Cup. Instead, the team is limping its way into the playoffs, losing its final six games of the regular season. Miller, who hasn’t seen playoff action since 2010-11 with Buffalo, has also struggled since coming over to the Blues. In 19 games, he’s posted a .903 save percentage and a 2.47 goals-against average while only winning 10 games. Jaroslav Halak, who was traded for Miller, has notched a .930 save percentage and 2.31 goals-against average in 12 games since the move. Head coach Ken Hitchcock will tell you that Miller is expected to be the best player on the ice in the upcoming series. The ability to which Hitchcock is referring could be his time with the Sabres when they were making long playoff runs. During the 2006 and 2007 playoffs, Miller posted a combined 20-14 record with a 2.39 GAA and a .915 save percentage. His Sabres reached the Eastern Conference finals in both postseasons. 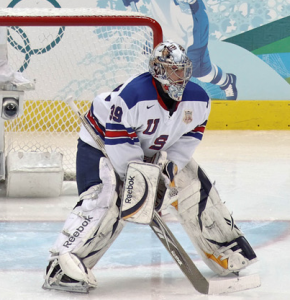 Perhaps he was mentioning the 2010 Olympics when Miller strapped the Americans on his back and led his team to a silver medal, posting a 5-1 record with a sparkling 1.35 GAA to go along with an eye-popping .946 save percentage. Despite not winning gold, he was named the tournament MVP. Because of these accolades, GM Doug Armstrong pulled the trigger and sent Halak, Chris Stewart, William Carrier, a 2015 first-round pick and a conditional 2016 third-round pick to the Sabres in exchange for Miller and Steve Ott — another Blue who hasn’t exactly lit the world on fire. The kicker? If the Blues reach the Conference finals or Miller re-signs before the draft, the third-round pick becomes a 2014 first-round pick. Needless to say, Blues brass is hoping that the famed goaltender pays dividends. Another interesting factoid in this situation is that only one NHL team in the expansion era has ever captured Lord Stanley’s Cup the year they acquired their starting goaltender. That team was the 1996 Colorado Avalanche and that netminder was the goaltending measuring stick, Patrick Roy. The end of the 2014 playoffs will either bring tales of defying the odds to the city of St. Louis or it will be a world of disappointment thrust onto a fan base that can hardly take any more postseason failures. Only one man stands in the way of this trade being spat on, crumbled up and thrown in the garbage. Only one man can keep this trade from being Butcher-ed.